A staple on any Scandinavian smörgåsbord, this salad can be enjoyed on its own or with meatballs. Scandinavian pickled beetroot tends to be sweeter than British, so make sure you buy a sweet variety or add a little icing sugar to balance any sharpness. 1. 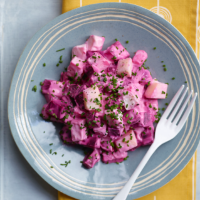 Cut the beetroot and apple into 1cm pieces, then mix both in a bowl with the mayonnaise and crème fraîche. You are looking for a good creamy consistency and a medium-pink colour. Season and add more mayo and crème fraîche to taste. Chill for 2-3 hours (or overnight). Just before serving, stir in the lemon juice and balsamic vinegar, and scatter over the chives. This recipe by Bronte Aurell of London’s Scandinavian Kitchen first appeared in the app edition of Waitrose Kitchen magazine, April 2015.